The football season is drawing ever-closer to an end, evoking despair or joy depending on how you feel about our beautiful game. Beyond the hype throughout the season, one man’s attitude has for me propelled him above all else. No, not Sir Alex, Mancini, the Special One or Jürgen Klopp – but Roberto Martinez. Adding my voice to what many already know and say – whether you enjoy or loathe football, or float somewhere in the middle – here is a man worth paying attention to. I’ve been captivated by the consistently pragmatic, calm and considered response Wigan manager Roberto Martinez has offered over recent weeks in response to questions about the cloud of relegation casting an ominous shadow over the club. Approaching his job with dignity and respect for others, he adopts classic project management styles, delivered more effectively than a Ben Watson FA Cup Final winning header. Forward-thinking and tactically astute, there is no blinking or flinching in the face of adversity. No negativity. No talk of defeat. No panic. What remains is pure focus and total belief in the plan set at the start of the season: that is, English Premier League survival. Sure, there may be some bumps and bruises on the way but the plan allows for that. With 38 games in a season and two remaining, everything is still going to plan. Martinez’s one admission is that he would have liked to achieved safety earlier, yet with Wigan’s destiny still in their own hands, the target of survival remains achievable and, according to Martinez, on schedule. More consistent than the Spring wind and rain in Dundee and exuding a calm inner confidence stronger than Scotland’s opposition to the bedroom tax, it’s hard to imagine or want any other outcome than the Premier League next season for Martinez and his team. At the heart of this focus seems to sit the core principles of project and crisis management: leadership, resilience, pragmatism, agreed and measurable outcomes and actions, trust in people, and clear and open communication. This latter point seems such a crucial element to the picture of success Wigan are presenting. 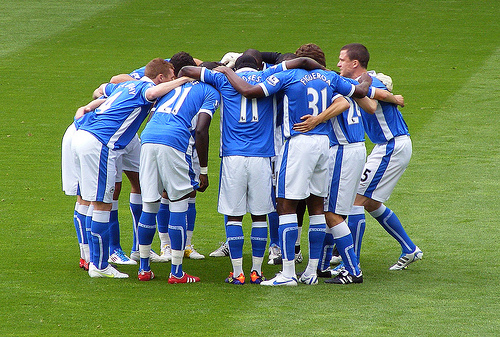 From Dave Whelan the Chairman, to the Manager and the community; what is said off the pitch is matched by the positive and attractive brand of football product produced on the pitch, leading to a positive enhancement and reinforcement of reputation. This, once again, highlighting your PR really is only as your product. Where credit for all this sits can seldom be attributed to one element alone and Wigan are no different. Yet I can’t help but admire how Martinez handles the pressure on his shoulders. Blending Whelan’s vision with Martinez’s talent to maximise the limited resources available to invest in those on the pitch (last weekend’s team was compiled for £12m compared to the £200m of their opponent), combined with his ability to effectively communicate, and to do so at the right time when all those around are panicking, is either very lucky or the perfect recipe. Either way, this success hasn’t been achieved overnight. It has been a long-term plan with sustained investment and sound financial acumen. There are lessons there for every business. It strikes me that even if Wigan are relegated their slide out of the league will not continue downward in the same manner and speed as other clubs such as Leeds and Wolves. Instead, the plan would be reviewed and measured action taken. I admire that. Like any good plan, it will be revisited, reassessed and refreshed. How that is communicated is central to the evolution of the club and team. For Martinez, it seems his mantra is that the plan is paramount and communicating that is central to success. Nice. I like that. So I’m going to start approaching life the Wigan way. Who’s with me? something like 90% of their turnover is TV money, and they spend over 90% of their turnover on wages, If they have a plan for relegation it had better be a good one. Martinez: “I never expected this to happen…tremendous group of players…as a football club we need to take the good things and build for the future. “The FA Cup gave us hope and finish the season on a real high with a sense of confidence. Relegation is something we can rectify and that’s what you do in football; make sure you get stronger. We’ll bounce back. The club is in a fantastic financial footing in the long term. ← Good Enough is Good Enough, the law of diminishing returns.